Dense shelf water formed in the Mertz Polynya supplies the lower limb of the global overturning circulation, ventilating the abyssal Indian and Pacific Oceans. 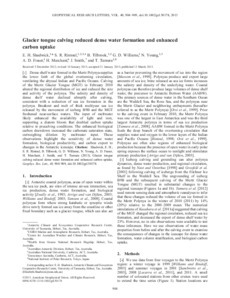 Calving of the Mertz Glacier Tongue (MGT) in February 2010 altered the regional distribution of ice and reduced the size and activity of the polynya. The salinity and density of dense shelf water declined abruptly after calving, consistent with a reduction of sea ice formation in the polynya. Breakout and melt of thick multiyear sea ice released by the movement of iceberg B9B and the MGT freshened near-surface waters. The input of meltwater likely enhanced the availability of light and iron, supporting a diatom bloom that doubled carbon uptake relative to precalving conditions. The enhanced biological carbon drawdown increased the carbonate saturation state, outweighing dilution by meltwater input. These observations highlight the sensitivity of dense water formation, biological productivity, and carbon export to changes in the Antarctic icescape.